Light Gallery cannot find your image path: images/articles/cuba! Estancia Cameron's recently refurbished administration house. Estancia has about fifty kilometers of frontage on the north side of the Río Grande. The wildlife and bird are much more plentifull than one on the Argentinean side. It's an excellent river for flyfishing, sometimes more challenging and rewarding than downstream in Argentina. Sea run browns average ten pounds. Monsters up to eighteen/twenty pounds. Also some resident river browns up to the six pound. And to completing the "Grand Slam", there are rainbows too. Cuba is the largest island in the West Indies and includes the island of Cuba, the Isle of Youth (also known as Isle of Pines), and over 4,000 keys and islets with more than 200 bays and over 300 natural beaches. The population of Cuba is approximately 11,000,000 inhabitants, Havana being the capital. Royal palm trees, coconut palms, sugarcane, and tropical fruit trees are all common to the island. Cuba features some of the richest flora in the world. With about 900 different kinds of fish and 400 kinds of birds, there are no animals that represent a danger to humans. Sugarcane is the number one crop, other crops include tobacco, citrus fruit, and coffee. Cuba has the world's largest open-pit ore deposits for nickel mining. Education is free at all levels. According to the Cuban government, illiteracy has been completely eradicated. Cuba has dozens of centers for higher learning. There are universities or faculty departments, high schools, special schools for the handicapped, and technical schools. Cuba's health-care system is unmatched elswhere in Latin America. It fully covers the needs of the country's citizens. Medical care is free for all Cubans. Cuba has the lowest infant mortality rate in Latin America and one of the lowest in the world:1 per 1,000 live births. The life expectancy rate is around 75 years. Cuban life is characterized by a wide variety of cultural activities. Literature, fine arts, cinema, ballet, contemporary dance and drama have all provided Cuban culture with internationally renowned figures. Cuban food is the result of a synthesis of Spanish and African culinary traditions, to which Chinese elements were added in the late nineteenth century. Ajiaco is the national dish: a thick soup made with meat (especially pork), along with different kinds of edible vegetable roots and stems. The taste will depend on the vegetables used, and the seasoning. Other typical Cuban dishes include: Lechon asado en pala - broiled pork cooked on a stick over an open fire. The excellence of Cuban rum, a product of its unique aging process, has made Cuban cocktails a perennial favorite the world over. Old-gold dry and extra-aged rums are best for drinking straight up or on the rocks. For cocktails, light dry and silver dry are ideal. The most famous Cuban cocktails served in most bars are Cuba Libre, Mojito, Daiquiri, Daiquiri Mulata, Havana Special, Piña Colada, Cubanito, Isla de Pinos (Isle of Pines), Presidente, Saoco, and Cuba Bella. With an average water temperature of 26º degrees Celsius (79º F), you will discover the best possible swimming conditions. Above all, you will enjoy the transparent Cuban waters with Avalon for fishing, scuba diving or snorkeling and the rich nature of the country's coral barrier reefs, which can be compared to Australia's Great Barrier Reef. Cuba's beach season lasts all year long, a never-ending summer from January to December. All of these characteristics have contributed to highlighting the exceptional subtropical natural elements that provide Cuba with a truly marvellous landscape. Just turn a corner and you might be amazed to find a green valley flecked with red soil. Further on ahead, a cluster of hills with crystal clear streams cascading into sparkling waterfalls. Aside from its famous Old City, Havana also has a fascinating modern section that began to grow quickly at the start of 20th century. Here you will discover houses of a unique eclecticism and tall buildings, products of Havana's contemporary vitality. Of all the suburban neighborhoods that make up this other Havana, the "Vedado" is the one preferred by everybody, Cubans and foreigners alike. Along their streets you will find the greatest number of theaters, art galleries, movies, cultural institutions, specialized restaurants, cafes, bars, and entertainment hotspots. Its main artery is 23rd Street, best known as "La Rampa", where you have to pay attention as you walk down the streets, because there is art under your feet, traditional works of art on tiles of multicolored granite that renowned Cuban artists such as Wifredo Lam, Rene Portocarrero and Amelia Pelez, among others, decided to offer the general public as a means of beautifying 500 meters of sidewalk. But there is another Havana, a nocturnal Havana, for all those wishing to discover the good vibrations of music that moves even the most rigid hips and reluctant spirits to be enjoyed, in discos and night clubs such as the Tropicana, the mythical cabaret under the stars, most coveted for its breathtaking shows and its rumba-dancing beauties who defy the sky when they emerge dancing from the trees. And what can one say about Havana's famous rum, savoured straight or on the rocks or mixed in fabulous cocktails, renowned as the best in the world. Of course we can't forget Cuba's world famous writer Ernest Hemingway, his country house (La Vigia) in San Francisco de Paula, on the outskirts of Havana, has been preserved exactly as the great American writer left it when he went on his final trip and is now a museum. Every single object, souvenir, hunting trophy, book and piece of furniture has been zealously preserved as an important part of the cultural heritage of Cuba and the world. Fishing in Cuba with Avalon Fishing Centers: Fishing in Cuba is a permanent delight and a mixture of incomparable sensations on the hour, in the exclusive fishing centers of AVALO at Jardines de la Reina (Gardens of the Queen), Isla de la Juventud (Island of Youth) and in its new center on Cayo Largo (Long Key) offers. You will be tempted with the most combative and acrobatic species, while enjoying the exclusiveness of a vast area of endless flats just for you. 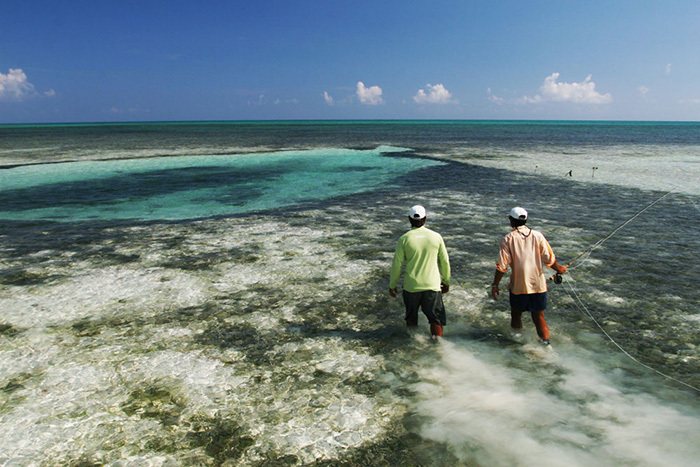 This is a unique and incomparable possibility that Avalon offers their clients, fishing in their own marine park on the southern coast of Cuba. There is no doubt that this is a once in a lifetime opportunity. 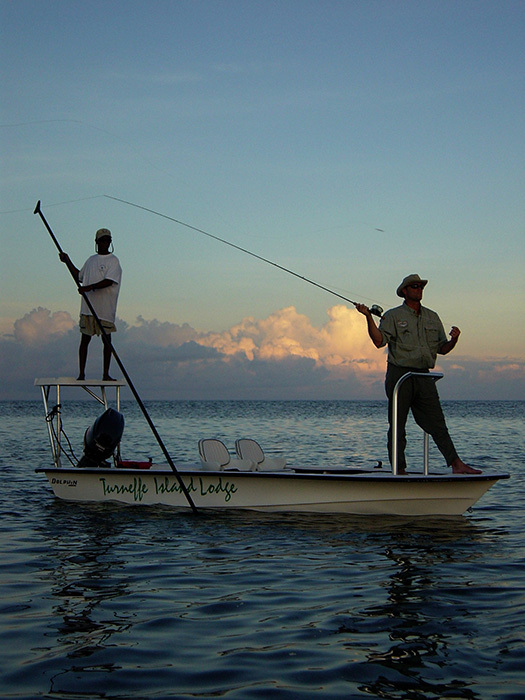 Imagine to be able to choose the place where you want to fish, and challenge the species you want and do so accompanied by the most experienced and knowledgeable guides, who spend almost 250 days every year guiding visitors and who enjoy all the benefits and opportunities that this amazing environment offers. These they are some of the species that you can fish in Avalon, Cuba: Bonefish or Macabi: This combative species allows the fishermen to be initiated into flats fishing, and is without any doubt one of the most combative fish, keeping in mind his relative weight – power. His long runs often leave the backing and at the same time they put to test the dexterity of the fishermen and his tackle. The weight of these fish oscillates between 3 and 6 pounds although usually we achieve fish that surpass 8 pounds. Their mouth, with pronounced upper lips gives their nickname of “mouse fish", this particularity obliges the fishermen to be very careful of the precise moment and during the fight since these slippery species often manage to remove our artificial flies - keep your lines tense, your rod over the shoulders and leave them running!!!! These will be some of the instructions that your guide will give you during the battle with these marvelous fish. The main food of this species is shrimp, and for that reason we should try and make flies which resemble these small invertebrates. Tarpon or Sabalo: Without a doubt, they are marine monsters. The exclusiveness and low fishing pressure that you will only find at Avalon Fishing Centers, allow you to find and to fish specimens running from 40 to 80 pounds average. In recent years various fish have exceeded 100 pounds. These fish make fishermen and guides extremely cautious, since they are very skillful and not at all clumsy in their movements despite their great size. An average fight before tiring one of these fish lasts about half an hour, and the fight will be a great show of leaps and racing of these enormous silver arrows. 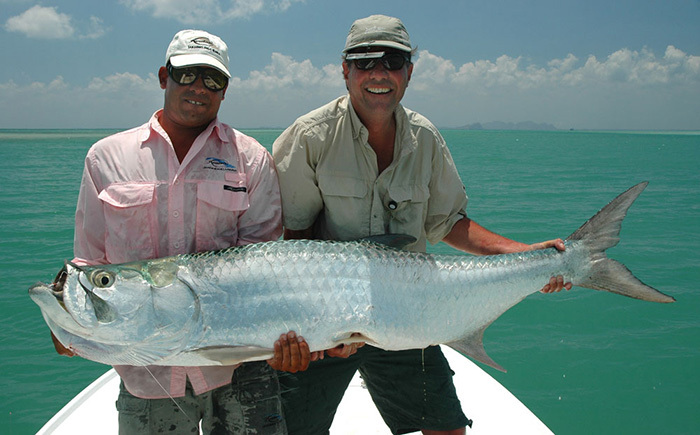 Without a doubt, large Tarpon fishing is an experience of a lifetime. They eat small fish, are hunters by excellence and their tremendous aggressiveness makes them a great species for using impressionist flies and decoys. 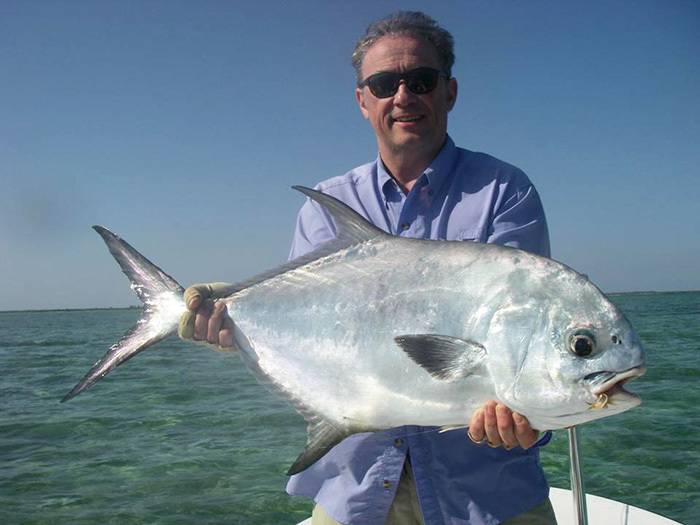 Permit or Palometa: Every flats angler’s holy grail and probably nemesis as well. They are undeniably the key species to achieving the elusive grand slam. Usually you will find them joining large schools of Bonefish, since they share the same main diet, crab. To be able to capture a few of this awesome species, you need to place special attention on launching and presentation because they are really easily frightened when detecting any uncommon movement or any “food” moving in an unnatural way. This demands concentration during the fight, but at the same time gratifies the fisherman who land any of them. Besides the mentioned species you will be able to fish other ones like Snappers, Jacks, Snooks Barracudas, Needlefish or the combative and voracious Lemons. The fishing day in Avalon begins at dawn. Your crew will wake you up and invite you to a delicious breakfast, including the freshest tropical fruits. After breakfast, your guide will be expecting you to start your fishing day. At noon you will have the possibility to relax and enjoy a lunch on one of the heavenly local beaches. Then off to taking up fishing again with force. At sunset, you will return to your boat where you will be delighted with a typical drink and appetizers recently prepared by the crew members. At night, dinner offers plenty of seafood, and the possibility of being a guest of honor with some recently trapped lobster - all prepared in the most diverse and original ways by your chef. All the live aboards include air conditioning and private bathrooms, which will allow you rest and recuperate to regain strength overnight in order to enjoy this tropical paradise during the day. This it is without doubts one of the points you will enjoy most, your eyes will be delighted with the various colors that this Caribbean water offers, coasts of different and white sand tones of a crystalline sea, since the blue intense one on the deep zones passing for the inequable tone that the funds of choirs offers, to the unmistakable color of the flats of sand near the coasts, where you will appreciate the incomparable underwater life that this region offers. The fishermen often we feel hypnotized and fascinated by the "sound of the silence", somewhat frequent by these spots, where you will only hear the noise of waves, or some dolphin that greets you near the skiff, of the amazing noise of your spool yielding line during the long races of some bonefish or permit, or of the marvelous crash produced by some tarpon that delights us and trembles with its numerous and acrobatic leaps after being hooked. Nothing of horns, engines or cell phones, only you, the nature and the adrenaline of fishing. Our last generation skiffs, all with very fast and stiff helmet, will allow you to travel conveniently and safe to every fishing destination during your stay in Avalon, one should recall that there are not fuel limitations, and you will be able to go to the best and hidden points of fishing without objections, all the skiffs have place for your fishing tackles and equipment, and a hidden cooler to keep fresh your beverages, fruits and food during the hole fishing day. The bow has enough space to support a fisherman without problems in the bar especially located on every skiff, which gives comfort and incomparable maneuverability while you cast and enjoy your fish. The Cuban weather is pleasant most of the year, the temperatures oscillate 25ºC in the day with a light descent during the nights, most of the day the breeze appeases the strong sun but likewise we recommend to carry a good solar protection as well as repellent blocker for mosquito’s, because in the afternoons they usually hound us for some minutes and is convenient to be prepared. The guides and crew of Avalon spend about 250 days every year in the sea, what gives them vast experience about every need, expectations and anxieties you may have, the work of the crew, sailors and captain, as well as your guide, begins on the same moment you arrive until the end of your fishing trip, and they will be able for you in any hour and circumstance. Our guides are specialists in any fishing modality, be fly fishing, spinning or bait casting, and they will advise you in every moment making your fishing trip an experience for a lifetime. The crew members are in charge of the ship, the food, room cleaning and general maintenance, so you should not be worried at all by any of these needs. DIVING Diving in Cuba and especially in Avalon Jardines de la Reina (Gardens of the Queen) is incomparable, you literally will be exhausted to see any kind of shark, caribbeans, silkeys, lemons, and even the coveted whale shark, which usually surpass 10 meters!! !, but sharks viewing is not the only thing that any diver will enjoy when choosing the Gardens, there is also numerous rich underwater life in invertebrates, mollusks, thousands of any kind fish and varieties, etc… There is no chance to be defrauded after diving these spots, enjoying the diversity and variety that only can be given on this exclusive paradise that allows its guests on choosing the species they want to dive with, the immersion difficulty degree, the duration, etc. The Hotel Rancho El Tesoro islocated on the outskirts of Gerona. 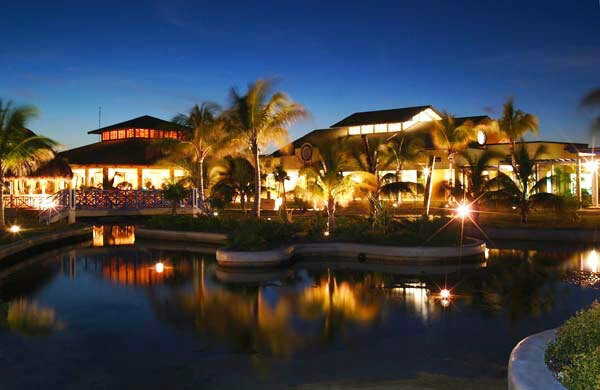 Hotel Rancho offers comfortable accommodations for our anglers. Security at the hotel is excellent. Meals are superb, a combination of classic Cuban dishes. The Perola is a 75-foot luxury live-aboard yacht thatwe utilize for weekly trips. This is a wonderful yacht, recently refurbished and perfect for a group of six anglers. We stop off at selected anchorages like Cayo Campo, Cayo Roserioand the Cantiles islands. Cuisine on the Perola is superb. The Hotel Rancho El Tesoro is located on the outskirts of Gerona, the Isle of Youth's largest city of 75,000 people. 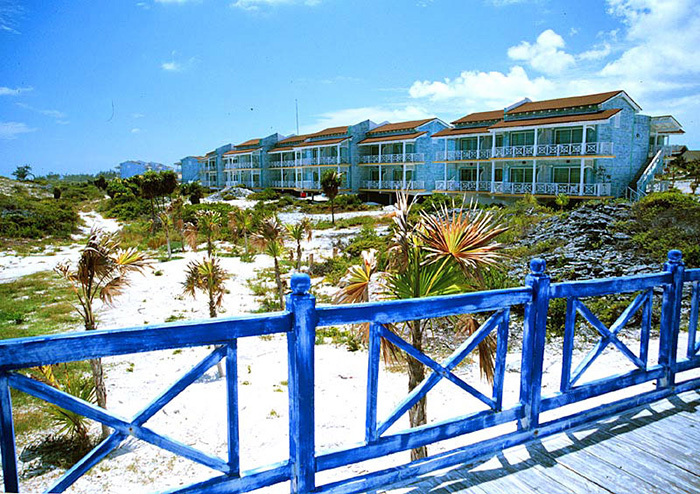 "Hotel Rancho" offers comfortable accommodations for our anglers with large single rooms for each angler. Each room has queen beds, airconditioning, lots of storage space and good showers. Your maids will clean your room each day and do laundry/ironing on request. (Please leave a suitabletip for these extra services) Security at the hotel is excellent and the front desk is open on a 24 hour basis. Telephone service is available to anywhere in the world as well as internet access for hotel guests. Meals are superb, a combination of classic Cuban dishes like smoked pork,chicken, black bean soup, rice and beans and fresh fish like mutton snapper and grouper. The french fries are out of this world. Salads with fresh tomatoes andother vegetables are served with olive oil and Balsamic Vinegar dressing. Our chef is happy to prepare sashimi from freshly caught fish of the day. Evening meals feature several different entrees, and our chef has often been accused off preparing enough food for twice the number of people we'll have at the table. We can promise you that no one will go hungry on this trip! Anglers staying at Hotel Rancho have their own private dining room, as well as their own private chef and wait staff. The dining room is air-conditioned and used not only for meals but also as a place to relax before dinner with a perfect Mojito and perhaps a classic Cuban Cigar. The Perola is a 75-foot luxury live-aboard yacht that we utilize for weekly trips to the more remote areas of the Canarreos Archipelago. We stop off at selected anchorages like Cayo Campo, Cayo Roserioand the Cantiles islands. This is a wonderful yacht, recently refurbished and perfect for a group of six anglers. There are five very comfortable air conditioned beds below deck, 4 single beds and 1 double bed, all shared cabins have their own private bath, with good showers and plenty of hot water,and lots of storage space for anglers. This is an impressive yacht, with polished hardwood floors and teak paneling. Circular stairways take you downstairs to the cabins or upstairs to the dining area on the top deck. The top deck is covered and always remains in the shade but open to the sea breeze, insuring a very comfortable and insect free environment. Clear plastic side coverings are utilized in harder winds or in inclement weather. Several comfortable rope hammocks are hung from the ceiling structureand can be lowered after lunch or dinner for a delightful nap in the breeze. A full sized, air-conditioned salon on the main deck level can be utilized for aliving and dining area in extremely harsh weather. Sinking into one of the plush couches with a good drink is the perfect way to end a long day on the flats and a full size table in the salon is the perfect spot for a couple ofanglers to tie flies. Cuisine on the Perola is superb. Fresh fish of the day are utilized for most meals, either caught by the anglers themselves or harvested by the crew. Lobster and Conch can be had on a daily basis from the surrounding waters. Salads with fresh vegetables and a variety of fruits are available any time. In addition, you'll have wonderful pork and chicken entrees during the week, fresh sashimi for appetizers and some of the finest frozen Daiquiris known to man. Traditional Cuban flan topped off with aged Havana ClubRum is one of the many unique and delicious deserts served. La Tortuga is adouble-decker, 110 ft.
Up to 14 anglers in 7 cabins. Up to 7 skiffs available. The Halcon is our recently refurbished luxury yacht with a storied past it is 75 ft.
Up to 8 anglers in 6 cabins. La Reina is 69 ft.long. Up to 8 anglers in 4 double rooms. Up to 4 skiffs are available. Caballonesis a 75 ft long. Up to 8 anglersin 4 double rooms. Up to 4 skiffs are designated to this yacht. 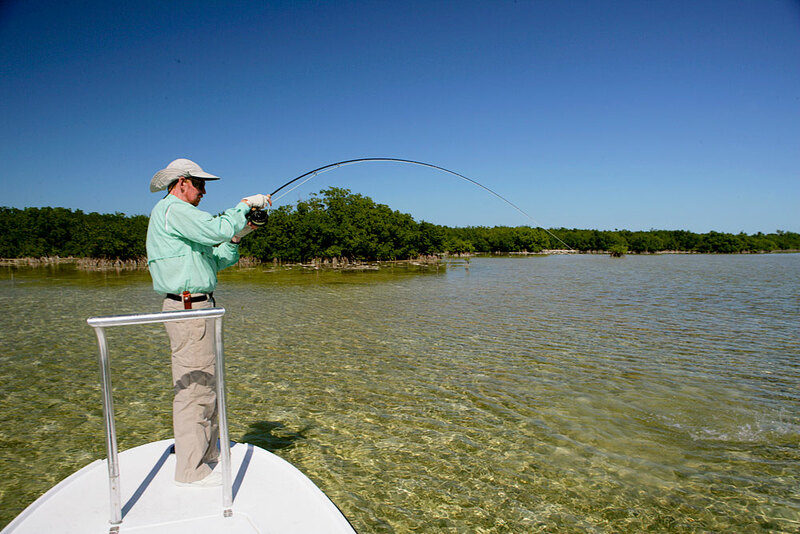 This vast marine park, which is bigger in size of the Florida Keys, is ideal for fly-fisherman who wish to live and experience fishing from dawn till dusk. Here we offer more fishing hours than any other destination. Jardines de la Reina is for those looking for adventure, absolutely amazing food with fresh seafood every day, and complete comfort. We transfer guest by bus from Havana to Jucaro port (5 hour drive), and then a 3-hour boat ride to final destinations which are approximately 60 miles from the Jucaro port. Here we have our floating hotel, Tortuga (1-14 anglers), and 4 yachts; Avalon Fleet I (Groups of 8 to 10 anglers), Avalon Fleet II (Groups of 10 to 12 anglers), and for smaller groups, we can offer 3 yachts, La Reina (groups of 4), Halcon and Caballones (groups of 4 to 8 anglers). 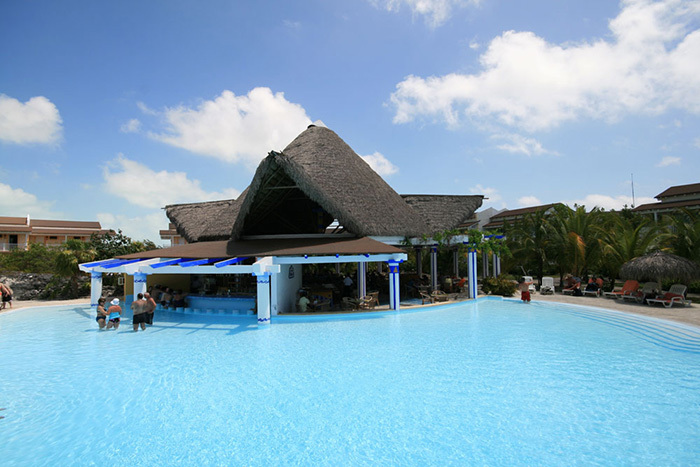 All accommodation are equipped with air conditioning, large dining areas and an exclusive crew. Guests on these programs can enjoy their fishing dreams from the minute they step aboard, and will be able to fish more hours and more species than in any other Caribbean destination. Here you will cast for large Tarpons (perhaps less BIG tarpon than on Isla de la Juventud, but more classic flats fishing for big tarpon and more variety). JDR is full of everything - Tarpon of all sizes, Permit, bones, Jacks, Barracuda - you name it. JDR is the favourite fishery of all destinations for many anglers around the world. ? ?The fishing hours are totally at the discretion of the clients. Our regular fishing day usually begins with breakfast at 7:00am, and your guides will be ready to depart for fishing from 7:45 am on. Most of the flats you will fish are within fifteen minutes of the yacht or accommodation, and it is always nice to take a lunch break in the comfort and shade, back on board the boat. Relaxing for an hour or so before fishing the long afternoons, especially during the warm summer season, is always a good idea. Lunches on board Caballones are particularly good, while we are a bit more limited in fare when making up box lunches for a full day on the water. Many of the more remote flats can produce outstanding fishing and your guides will suggest the evening before that you pack a lunch and stay out all day in order to access some of the more distant flats and estuaries. Clients can fish late into the evening if they like, since it is usually only a short run to get back to the Caballones. 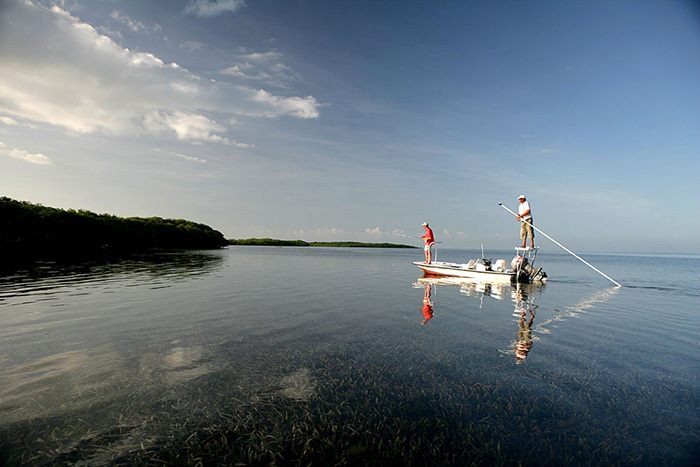 In Jardines, the morning winds often calm down in the afternoons, and fishing in the late afternoon can be superb, especially for bonefish. There is never a daily gasoline limitation for our guides, so you can run longer distances to fish remote flats, especially on those days when you opt to stay out all day. Our fishing weeks on board the yachts run from Saturday to the following Friday. Our season in the Jardines de la Reina is from mid-October to end of August. A normal week includes five full days of fishing and one to two half days depending on your schedule and mode of transportation to Jucaro. Clients board the yachts, Sol or Mares, for the trip to the Jardines de la Reina, where they will then board the Caballones.